Since 2005, German DVD purveyor Edition Filmmuseum has been picking up on smaller, lesser known vintage films that might perhaps get passed on by Criterion for their Eclipse series. Their library contains not only silents, documentaries and short film collections, but sets devoted to contemporary filmmakers as well. Like Criterion, their offerings are as nicely presented as possible with clean prints, good scores, multiple subtitle options and booklets containing informative essays on each film. For Edition Filmmuseum's 83rd release, they revisit the works of silent-era German director Gerhard Lamprecht (1897-1974). This 2-disc set is a continuation from their previous Lamprecht two-fer, The Final Stand & Children of No Importance, which I also enjoyed. 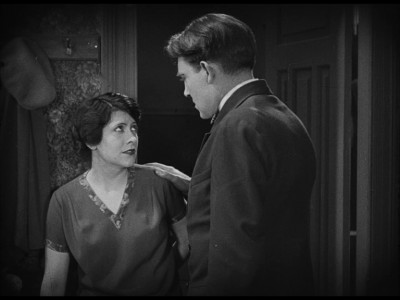 While the previous set delved into Lamprecht's knack for gritty social commentary, with plots dealing sympathetically with the plight of ex-convicts and orphaned children, the two films on this particular set show the director moving into more ambitious territory - incorporating melodrama, more complex characterization and plotting, and better production values. 1926's Menschen Untereinander (a.k.a. The Folks Upstairs) and 1928's Unter der Laterne (a.k.a. Under the Lantern) display Lamprecht as something of a German counterpart to what King Vidor accomplished with The Crowd in Hollywood - effortlessly using cinema's best techniques to tell intimate stories of human struggle. Literally translated as "the people among us" and the melodramatic Menschen Untereinander follows a cross section of post-World War I Germans who all live and work within the same urban apartment building. Lamprecht introduces the characters via the newly arrived janitor's wife getting the lowdown on the tenants from a gossipy resident. Over the next few minutes, we are introduced to a destitute old musician who eventually becomes the house pianist for the dance studio sharing the building, a once-wealthy widow and her idealistic son, a family of jewelery merchants, a jocular balloon vendor and several others. Two recurring plotlines take up the bulk of the film, however. In one, a government assessor (Alfred Abel) is haunted by a scandal involving his wife (Aug Egede Nissen), jailed for manslaughter and forced to have her baby while imprisoned. While the woman's husband and father try to shorten her sentence, the young mother anxiously frets over whether the prison will force the baby to be adopted out to a more stable family. 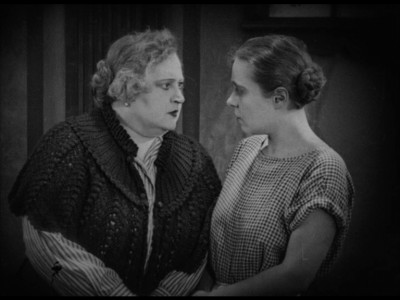 The other main plotline concerns the building's self-centered landlady, the widow Büttner (Erika Glässner), who ignores the needs of her tenants in favor of her own frivolous pursuit of a husband. A matchmaker (Margarete Kupfer) introduces Mrs. Büttner to a suave gentleman (Aribert Wäscher), who turns out not being the ideal mate she initially envisioned. Although the two main stories are presented in the typical, melodramatic style of the day, mostly what stands out with this film is the sensitivity Lamprecht gives to depicting the day-to-day activities in the building. Not only do they set the mood wonderfully, it must have been a sort of balm to its original viewers, still recovering from the war and making sense of Germany's rapid modernization. Another form of audience-gratification is played out in the various stories, with the decent-hearted characters being rewarded while the noxious ones get their "just deserts." Now this is quite a change from Lamprecht's scrappy, early social-commentary dramas. The expertly crafted plotting and slick production values on display in Unter der Laterne (Under the Lantern) give it a professional appearance similar to the contemporary output of Paramount or Metro-Goldwyn-Mayer in the states. Under the Lantern's epic "Fallen Woman" story centers on a plucky city-dweller, Else (Lissy Arna). Disobeying her stern widower father, Else goes to the local beer garden for a clandestine date with her boyfriend, Hans (Mathias Weiman). Kicked out after her transgression is found out, Else ends up staying in Hans' apartment, where the two pretend to be siblings for Hans' roommate, Max (Paul Heidemann). Max persuades the others to form a vaudeville trio with the men performing in a horse costume, which proves to be a huge hit - although it attracts the wrong kind of attention from their sleazy agent, Nevin (Hubert Von Meyerinck). After a misunderstanding involving the lusty agent, Hans casts Else out of his life and back onto the streets - beginning a steady downfall in which she becomes Nevin's luxuriously appointed lover and, eventually, a common street walker. Several years later, a chance encounter with Hans offers Else the chance for redemption she's always yearned for. Although it tends to get overstated and poky-paced, Lamprecht portrays the story and characters with a great deal of sympathy, framing the film in a "this could happen to anyone" context. 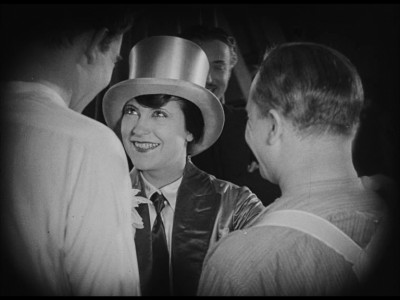 Lamprecht also gets a worthwhile, expressive performance out of actress Lissy Arna, who has a startlingly contemporary appearance (at times she resembles the actress Ruth Chatterton). For silent film fans, this Lamprecht set is a terrific find. Taken with the writer-director's other two films included on The Final Stand & Children of No Importance, the two Edition Filmmuseum packages supply a varied, fascinating look at flourishing between-the-wars German cinema from one of its most individualistic artists. Edition Filmmuseum's Menschen untereinander & Unter der Laterne comes as a Region 0 PAL release, which may not play on many Sony-made American home video players (like mine, unfortunately). They are playable on personal computers equipped with a DVD-ROM drive, however. The discs are housed in a standard-width transparent hinged DVD case which comes with a nice 16-page booklet containing vintage stills and promotional materials, and a comprehensive essay on Lamprecht (written by historians Jörg Becker, Rolf Aurich and Wolfgang Jacobsen) printed in German, English and French. Menschen untereinander & Unter der Laterne utilizes weathered yet complete prints taken from Germany's Deutsche Kinematek. 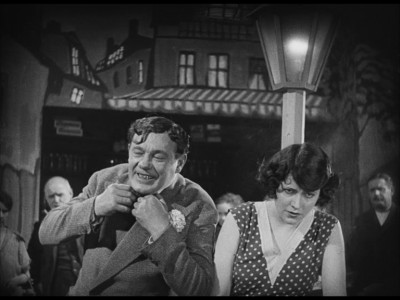 Menschen untereinander is mastered from a surviving 16mm copy made in 1935, the only copy known to exist. The lower-grade film is apparent, although it looks clean and pleasant. Unter der Laterne was mastered from a fantastic looking 35mm negative with English-language intertitles, although they edited in the original German intertitles from a 16mm copy. For the digital restorations on both films, the image was stabilized and artifacts were cleaned up while retaining the films' original texture and light-dark balances. Both films in this set have three audio options, selectable from the main menu: complete silence; pleasant, authentic sounding synthesizer-based scores from composer Donald Sosin; and avant garde, multi-instrumental scores from experimental rock band Ensemble Mosaik (on Menschen untereinander) and jazz combo Shortfilmlivemusic (on Unter der Laterne). I preferred the moody, thoughtfully done Sosin tracks over the randomly composed modern ones, although it's nice to have the two options (and they're all pleasantly mixed in Dolby Digital 2.0). The films' original German title cards are supplemented with optional subtitles in English and French. No extras on the discs themselves, but the booklet is an informative plus. Nice! 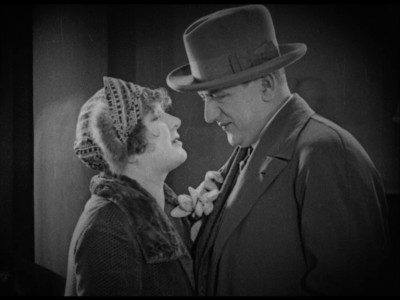 Edition Filmmuseum's worthwhile exploration of German silent director-screenwriter Gerhard Lamprecht continues with the fun two-disc set Menschen untereinander (1925) and Unter der Laterne (1928). Not as poignant as the earlier films included on The Final Stand & Children of No Importance, yet both efforts are hard-hitting, evocative, sympathetically told stories which often delve into pure melodrama. Recommended.